Did you miss the library’s Information Literacy Series event on October 23? Don’t worry – we have audio for all the lightning talks that were given, as well as slides for some of them. Below you’ll see mp3 recordings of the talks, and slides or visuals as they become available to us. For more information about the event, click the link “Information Literacy Series event” above. 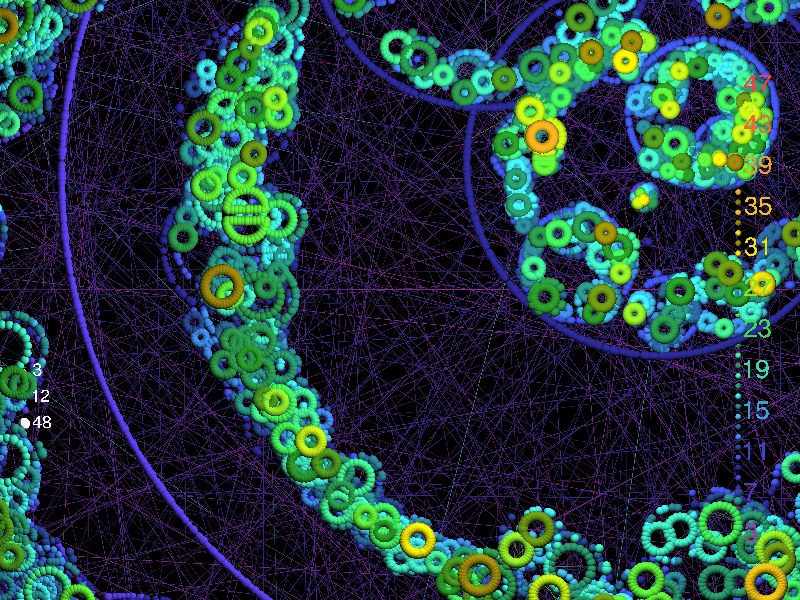 Nathaniel Lin (Mathematics): Is Big Data the New Oil? Please join us on Wednesday, October 23, for the fourth event in the Bentley Library Information Literacy Series, “Lightning Talks About Big Data: Making Sense Out of Massive Amounts of Information.” Bentley faculty and alumni will present focused talks of 5-7 minutes on how they make sense out of big data in their disciplines. Join us in the library’s Art Gallery during the following times. This event is presented in conjunction with the library-produced exhibit “Making Visible the Invisible: Library Data Transformed,” which begins October 21. Founded in 2011, the Bentley Library Information Literacy Series is a series of lectures, panel discussions, and other events featuring experts in the field of information literacy. The series is designed to bring together librarians and experts from other fields inside and outside academia in order to bridge gaps in knowledge and understanding, and to expand awareness and critical thinking about information literacy. The events in the series are aimed at undergraduate and graduate students, faculty members, librarians, and anyone with an interest in teaching and learning in an era of rapid change in information delivery and discovery. 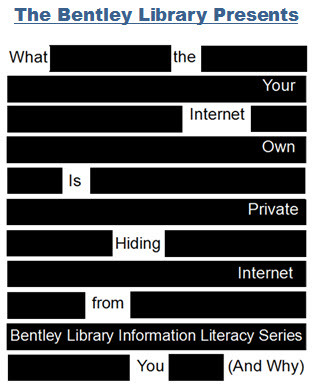 On March 20, the Bentley Library Information Literacy Series hosted a panel of three experts and a moderator to talk about the phenomenon of personalization on the Internet known as the “filter bubble.” In case you missed it, we are happy to announce that the video is now available streaming (here). “A world constructed from the familiar is a world in which there’s nothing to learn.” So wrote Eli Pariser in his 2011 book The Filter Bubble, about the ever-increasing personalization Internet users experience. Is he right? How can we evaluate information when it has been hand-picked for us – what are we missing when we search for information, and how do we know? How do crowdsourcing and other, more traditional conceptions of authoritative information contribute to this information environment? Is there an inherent tradeoff between precision and personalization when searching on the Internet? A panel of experts and researchers will convene at Bentley University to discuss these questions and others related to evaluating information on the open and social web. Join us in LaCava 305AB at 5:30 for light refreshments, with the discussion getting underway just before 6:00. Join us in LaCava 305AB at 5:30 for light refreshments, with the discussion getting underway at 6:00. If you plan to bring a class to the event or will require students to attend, please RSVP to Liz Galoozis by March 10. Please join us on Thursday, March 29, for the spring installment in the Bentley Library Information Literacy Series, featuring Laura Saunders, assistant professor at the Simmons College Graduate School of Library and Information Science. Light refreshments will be available in LaCava 325AB at 3:30 pm, with the event getting underway at 4:00 pm. Prof. Saunders is a former academic reference and instruction librarian who holds master’s and doctoral degrees in library and information science from Simmons. She is an expert on information literacy and will speak about the future of information literacy—how research and evaluation skills transfer from high school to college, and from college to beyond, and how faculty and students both contribute to students’ ongoing learning of information literacy skills and concepts. More information about Prof. Saunders and her research and teaching is available on the Simmons College GSLIS website. Please RSVP to Liz Galoozis by March 15 if you plan to bring a class to the event or will require students to attend. For library colleagues attending from other institutions, a tour of the Bentley Library will follow the talk. Information literacy is crucial to seeking and understanding information, whether you’re writing a research paper, making health-related decisions, or trying to find unbiased news coverage. Want to see what the Bentley Library does to promote information literacy? Visit our Information Literacy and Instruction Research Guide to learn about library instruction and initiatives related to finding, evaluating, and using information of all kinds. Curious about what this has to do with being a member of the business community or of a business university? Come to the library’s October 26 event “Who Wrote This and Why Should I Care? Evaluating and Understanding Information in a Business Context.” A panel of experts will discuss the challenges of evaluating information, and being information literate, in an ever-changing information landscape. More information can be found in this blog post. For even more information on information literacy, click on the badge in this post to be taken to the website of the National Forum on Information Literacy.